Partly with an eye to the requirement for NZEB, the Passive House Institute is introducing two new standards that allow credits for on-site renewables. However, as Jessica Grove Smith explained, renewables are not in any way a substitute for efficiency – in fact, any hope of matching energy demand with renewables is fundamentally dependent on ultra low energy use. However, the UK government has decreed that the (not yet finalised) zero carbon standard, will meet the obligations for NZEB. The probable requirements of the UK 2016 zero carbon standard will likely lag well behind passive house. Nevertheless David Adams, the director of the Zero Carbon Hub (set up to advise the government on the standard) came with a plea to the audience to defend its recommendations (based around a fabric standard of around 40-45kWh/m2/yr, depending on building form), for fear these would be further diluted by industry. Adams reminded the audience that from the start there had been continuous pressure downwards on the zero carbon standard, but “crucially, a requirement for as built performance was brought in” because of the size of the performance gap. Adams had less to say about how the government might eventually regulate as-built performance. However, as conference chair Lynne Sullivan of SustainablebyDesign reported, the Zero Carbon Hub has done detailed work on the issue over the past 18 months. “Everything they ask for is inherent in passive house methodology and by being part of the [passive house] community,” she pointed out. In contrast Sebastian Moreno-Vacca of A2M described the process by which in 2011 the city of Brussels legislated to require all new buildings to attain passive house standards from 2015. “We legislated first and discussed afterwards,” he said. While we might not dare to dream of a Brussels-like conversion at the Department of Communities & Local Government, lack of commitment to driving down carbon emissions in the UK need not be an obstacle for passive house. In fact a couple of the prominent passive house clients at the conference declared that they weren’t interested in carbon, but were procuring passive house because they believed it best met their occupants’ needs – for comfort, health, and relief from fuel poverty. Social landlords and private clients alike are commissioning Enerphit retrofits for the same reasons. In the absence of any other quality assurance system in UK construction, it does seems that the guarantee of performance is driving uptake of passive house. But building to the passive house standard does not fit naturally into the conventional way of doing things on a British building site. Veterans of passive house construction sites had plenty of practical advice. The team on the ground need to know that something different is required for a passive building, delegates heard, and ideally have an incentive to achieve it. Tomas Gartner of architects Gale & Snowden suggested the main things that need to be updated are the conduits of communication. He suggested that incentives, such as early payments for getting details correct on site first time around, might be worth exploring. But time was really the most valuable resource, he said. “You need to be brave enough and have enough leeway to be able to say if you not happy with a subcontractor – off you go.” But the client has to be willing to allow extra time for this too, he added. 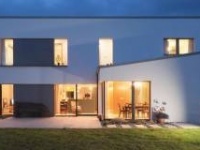 It was notable at the conference that passive house is no longer seen as an extravagance — not least because in some instances, it has been the money-saving option, the value engineering solution that has allowed a cash-constrained scheme to go ahead. Other projects that were required to add renewables to meet various sustainability specifications made valuable savings by designing to the passive house standard, enabling the outlay on renewables to be reduced or even eliminated altogether. 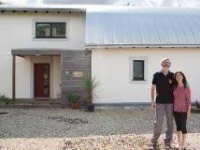 A phrase that cropped up a few times was “the business case for passive house” – including from clients who didn’t have a direct financial interest in the energy savings. From a purely commercial point of view, landlords are judging that building to passive house gives them the theoretical option of charging higher rents, important when raising finance. And it is finally starting to look as though the increased asset value is being formally recognised, with Jon Lefever of Hastoe Housing Association gleefully reporting that he had received a valuation for some homes under construction that added £10,000 per unit to the value purely on the strength of the passive house standard they will meet. With retrofit, the purely commercial case can at first be more challenging. 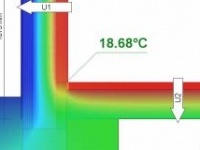 Enerphit retrofits sometimes cost more than demolition and rebuilding. However, as the conference heard from the team refurbishing Erneley Close in Manchester, the beauty of a retrofit that takes place mostly on the outside of a building, is that occupants get to stay put, or only have to move out briefly. Thus, the social fabric of the neighbourhood does not need to be rebuilt from scratch. So while a lot of agonising is done about the cost-effectiveness and energy payback of deep retrofit, perhaps this is missing the point. “Comfort is something our clients were not prepared to compromise on,” said Marine Sanchez of Green Tomato Energy, describing the deep retrofit of a 19th century terraced home. 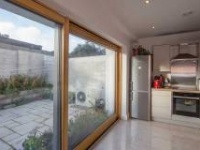 Even so, there is a huge cost issue with deep retrofit of the UK’s older housing stock, stemming from, “the especially sentimental attachment in the UK to the way our old buildings look,” Bob Prewett of Prewett Bizley Architects noted. The cheaper external insulation option is often ruled out for these buildings, but internal insulation brings with it issues of cold bridging and altered moisture movement. On top of this the building fabric may be in poor condition, and suffer from damp. Back with new-build, the conference heard that post-occupancy surveys are revealing that the occupants of new passive house dwellings are delighted with their homes. However, one or two have been a bit warm. Meanwhile, energy monitoring has shown that while many passive homes are using even less heat than was predicted, some are nonetheless exceeding their primary energy targets, with higher than predicted electricity use. It is possible that in some cases the overheating may be linked to internal gains, though without more time to research occupant ventilation and shading behaviour, it isn’t possible to be certain. Most of the homes in these studies are small. The passive house apartments designed for Exeter City by Gale & Snowden, which are showing higher-than-predicted primary energy use, are as small as 50 square metres. However, high gains need not mean overheating. This may be where the intensive (twice-yearly and ongoing) occupant ‘training’ in the Exeter passive house apartments is paying off: all occupants apparently make effective use of the designed cross ventilation and, despite some very hot weather, all have remained comfortable. And anyway, it isn’t always the warmest houses that spark overheating complaints. Personal preference is the true arbiter of what counts as overheating – whatever PHPP may say. Martin Ingham of Linktreat added another insight, reporting that it was the householders who seemed not to have grasped how to manage their homes for cooling who reported discomfort, rather than the ones in the warmest homes. It was satisfying to go into the nitty gritty of building performance in the company of such a well-informed audience, and many of the discussions could have gone on for longer. Many delegates commented on how they wished they could have attended more of the sessions, too. We’ll have to wait to see whether the organisers pack the same amount, or more, into a single day next year, or whether the event bursts its banks in 2015 and spills into a second day.